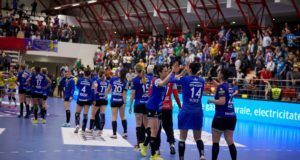 CSM Bucharest defeated on Sunday the Russian team Rostov on Don 24-21 (12-10) in the first leg of Group C of the Champions League. CSM led almost the entire game, by 5-3 and 15-12 at half time. The score was even in the 43rd minute (16-16) but then the Bucharest team again took the lead to win 24-21. CSM: Paula Ungureanu, Jelena Grubisic — Isabelle Gullden, Iulia Curea, Camille Ayglon Saurina, Aurelia Brădeanu, Linnea Torstensson, Carmen Martin Berenguer, Oana Manea, Gnonsiane Niombla, Anastasia Lobaci, Majda Mehmedovic. Coach: Jacob Vestergaard. Rostov: Galina Mehdieva, Katrine Lunde — Elena Slivinskaia, Iulia Managarova, Maia Petrova, Ana Sen, Ana Paula Rodrigues Belo, Ana Viahireva, Vladlena Bobrovnikova, Ksenia Makeeva, Olga Cernoivanenko, Siraba Dembele, Ekaterina Ilina, Lotte Grigel, Alexandrina Cabral Barbosa, Viktoria Borshcenko. Coach: Jan Leslie Lund. In the other match of the group: Györi Audi ETO KC 31 FC Midtjylland 19. In the second leg, CSM Bucharest will face away FC Midtjylland on Octover 22. Next: Ex-Interior Oprea heard for culpable homicide. What did he convey to policeman Gigina’s family?